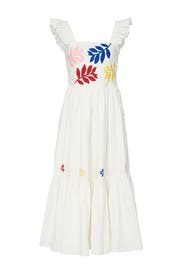 This airy CAROLINA K maxi dress gets a romantic feel with flutter sleeves and vibrant embroidery. Sized: XS-L, one length available. Regular measures 52" from shoulder to hemline. White linen (100% Linen). Maxi. Flutter Sleeves. Square neckline. Side zipper. Fully lined. 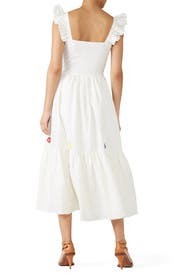 51" from shoulder to hemline. Imported. 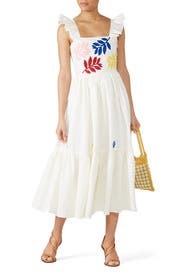 Love this dress - it is more cream than white and will definitely require some good steaming out of the bag but once it's pressed it looks great. I have worn this same style in pink and found the pink dress to run very large while this one is much more true to size! I actually had to get help with the side zipper where as the pink dress I just stepped into without unzipping to get into it. Perfect for vacay! Love the length and ruffles! The only area it was tight was the bust - couldn't wear a bra with it. 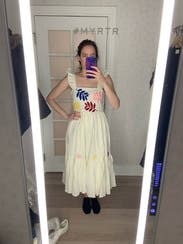 Full skirt, linen, size down! I rented this to take with me on vacation to Florida. Thankfully, I tried the dress on at the RTR store before bringing it home because I immediately returned it. It was not my style at all. 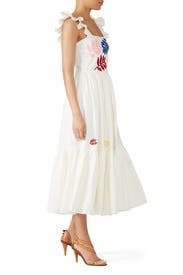 The dress itself is VERY boho with a full skirt. Like, this skirt has some serious weight to it. I'm also 5'9" and I felt like the skirt was long on me. Top right and bottom shirt old fashioned. 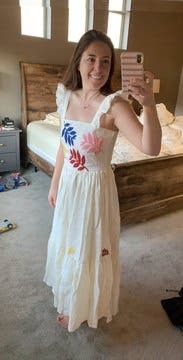 My boyfriend's parents called it the "Matisse Dress." Straps were a little loose, might have been better with a size down, but still very pretty!